Pica Pica Gift Certificates make the perfect gift for any occasion. Purchase one online here today and treat a friend, family member or business associate! Good food is central to the best times in life; our food is hand-made, slow cooked and best eaten with your hands. Our Arepas (grilled corn pockets) are crunchy on the outside, moist on the inside, and stuffed with traditional Venezuelan-inspired fillings. 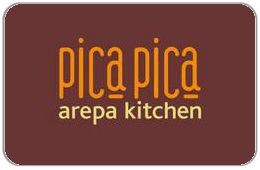 For balance inquiries call the phone number to a Pica Pica Arepa Kitchen's location below.